With the addition of my stepson W to our family, there are definitely new challenges in the kitchen. Though I don’t need to dramatically change my cooking regime, there are times when I restrain myself from cooking too unconventional as he doesn’t have the adventurous taste buds the kiddo has. Sometimes, in real-life kitchen situations conformity is good. So let’s talk about fried chicken and how the boys like it. Korean-style, saucy teriyaki or garlic-marinated is great but crispy is the best. The kiddo loves wings while W likes drumsticks. Not a big problem when I have whole chicken as everybody gets the part they want. But one is limited to only 2 pieces each. Bitin. At feeling ko naman nahihilo ako pag puro drumsticks. So for everybody to enjoy chicken wings… chicken lollipop is the answer. Chicken wings have 3 segments – the drummette (the one that looks like a small drumstick), the middle flat part with 2 bones (the tasty part! ), and the wing tip. Wing tips, most of the time I throw them away; on certain occasions I keep them and use to make chicken stock. What I usually buy are chicken nibbles, which consist only of drummettes and ‘wingettes’ sans the tips. Cooked this way, the untrained eye won’t know the difference haha! Oh, and panko breadcrumbs give ‘em the delicate crispness the boys love. Maligaya ang lahat. The key to prepping chicken lollipops is to use a sharp knife. Hold the thin end of the drummette firmly then cut the skin and tendons around this area. Scrape the meat down to the bottom but mindful not to completely remove the meat from the bone. Using your fingers, push the meat downward and over the thick end of the bone to invert the meat and form a lollipop. 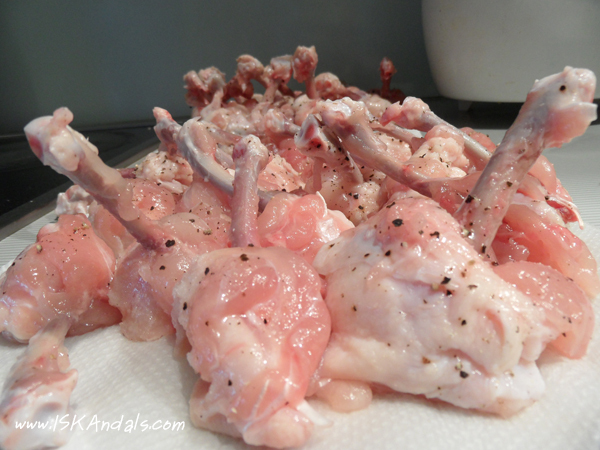 When using the wing part, separate the joints on one end then proceed to scraping the meat as with the drummettes. This time, do it on two bones but pull out the smaller one to discard. Dry them on paper towels. Sprinkle with freshly ground black pepper and salt. Let stand for 10-15 minutes. Position your dipping platters like this: next to your hob is a bowl of Panko breadcrumbs, then a bowl of 2 lightly beaten eggs, then a plate of unsifted flour, then the chicken lollipops the farthest from your hob. Heat 3-4 cups of vegetable oil in a wok or deep fryer until medium hot. Holding the bone, dredge the meat part in flour and shake off the excess. Dip into egg then roll in breadcrumbs to coat evenly. Place carefully into the hot oil. Repeat until you have about 6-8 pieces in the wok. Do not overcrowd. Deep-fry until golden brown, each cooks approximately 10 mins. Once cooked, take out and drain for few minutes in a colander/strainer. I drain them 3-4 pieces at a time before arranging on a serving platter. I don’t put one over the others in a colander as this may soak the chicken at the bottom in oil. Dredge, roll and coat more chicken lollipops to replace cooked ones. I don’t prep and coat all of them before frying; I find that this process loses the crunch. Happy boys! We had baby potatoes and green beans salad as sides and finished them off with peaches. Dry them on paper towels. Sprinkle with freshly ground black pepper and salt and let stand for 10-15 minutes. Dredge, roll and coat more chicken lollipops to replace cooked ones. I don’t prep and coat all of them before frying; I find that this process lose the crunch. I'm a bit slow, no practice and all; it took me about a minute to do 1 lollipop. Prep time can be shorter depending on how fast you are. 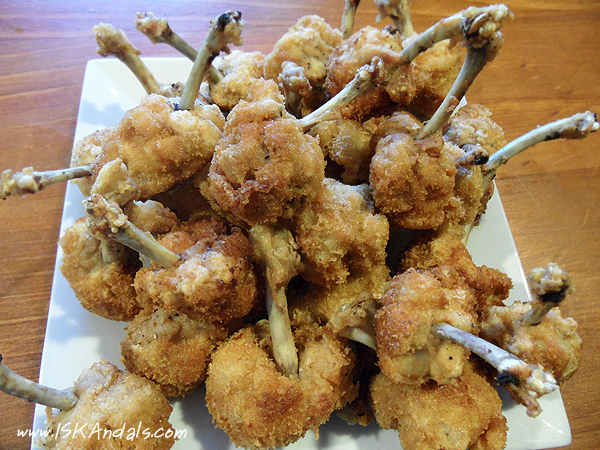 yum…chicken lollipop looks delish and thank you for the recipe too. This is in my to do list Visiting from Yummy Sunday, hope that you can return the visit too. How creative indeed! And they look truly yummy, too! Yummy!!!!! Love it with fries. Always the favorite of kids! I love it with ketchup! ooohhhh, i love chicken lollipops. should make this one of these days. thanks for sharing your recipe! Challenge for me ang gawing lollipops ang mga drummets, at isa ring challenge ang humanap ng chicken wings na maputi pa ang mga buto kasi kung hindi, parang nakakahiyang i-serve ang mga lollipops. I still haven’t really tried serving Chicken Lollipops (I once did just one lollipop – just for me), but there’s this recipe I just found that used guava jam as sauce, so I am thinking of cooking this one soon. Thanks for sharing the recipe! yumm..oo nga ano. why didn’t i think of this! my kids love the ccrrrruuunnncchhh (lol), too..
will try this real soon..
looks yummy,i love that too. looks really yummy, something i need to learn and try soon! thanks for your recipe and tips! visiting from WE, hope to see you around. thanks and have a great week. I love my chicken crispy, too. In our family, I am the picky eater, so my siblings really do make adjustments, but oftentimes, when they know I won’t like the dish they will prepare for the family to eat, they will just fry a piece of chicken for me and I am one happy foodie. Hopping here from Weekend Eating. Jessie recently posted Halo Halo Cravings – Satisfied! You have a lovely family that looks after you, Jessie Good on you! Thanks for the recipe! would love to try this one! I’m sure that’s so yummy! 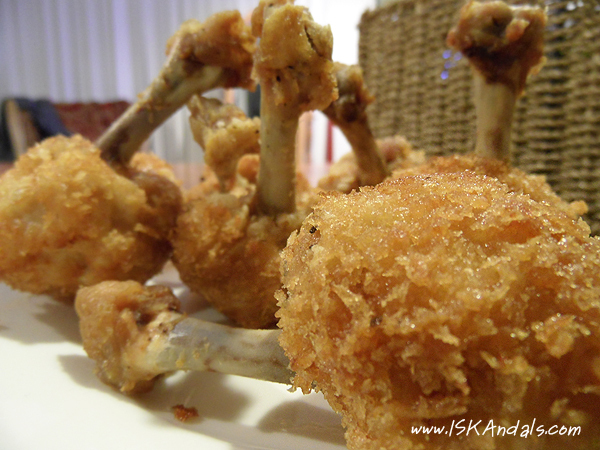 Chicken lollipops, they just got me salivating. I will love to have some of those. You can’t go wrong with fried chicken! nomnomnom! Thanks for the visit! And for those who will try… happy cooking!